One of the Library’s main functions is to gather materials which help folks live better lives. In pursuit of that goal, the Library acquires books and other items to help people learn how to do things. Since I arrived in Boulder City 18 years ago, I have developed more than a few personal goals for the Library. Many of those goals have been realized but some, like the proverbial “carrot on the stick,” are a motivator along a path which probably has no end. This doesn’t sound like the beginning of a discussion on cookbooks, but it is. My wife and I, over the years, have really enjoyed discovering new (for us) cuisines and trying out new recipes. We’re not what you would call gourmet cooks, though, and are not at all fussy about substituting ingredients (onions for shallots, A-1 for Worcestershire sauce because we didn’t feel like going to the store). All this time, bit by bit, I’ve been selecting cookbooks for regional and international cuisines, looking at recipes and trying them out. The personal goal is to create the very best collection of cookbooks in any public library around. When someone comes to the Library looking for Thai or Philippino recipes, we should have something for them: Southern BBQ, Spanish seafood, kebabs and couscous, pulled pork, or Santa Fe chipotle. 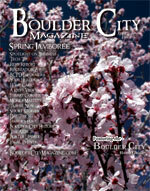 Many Boulder City folks have dietary issues and restrictions related to one or another medical condition. So along with buying regional and international cookbooks, the Library acquires low-sodium cookbooks, diabetes cookbooks, low-cholesterol cookbooks, vegetarian and macrobiotic cookbooks, and many others. Has the Library achieved a pinnacle of perfection with its cookbook collection? I don’t think so because I continue to find new cookbooks that I can’t resist buying for the Library! I do think our cookbook collection is pretty darn good, though. Cuisines of Eastern Europe (Poland, Hungary, Russia, etc.) and Sub-Saharan Africa are thinly represented, so I’m especially looking for those. We’ve got fairly extensive coverage of French, Italian, Mediterranean, Asian and U.S. regional coverage. Come on in and take a look at the cookbook collection. Break out of your rut and try something totally new for your next dinner party!